The Malta Mediterranean Literature Festival will be held from Thursday 24th until Saturday 26th August 2017 at Fort St Elmo, in Valletta. The XIIth edition of the Malta Mediterranean Literature Festival organized by Inizjamed in collaboration with Valletta 2018 will be held from Thursday 24th until Saturday 26th August 2017 at Fort St Elmo, in Valletta, starting from 8.00pm. The pre-Festival events start on Sunday 20 August. Entrance to all events is free. Twelve writers from eight countries are reading at the festival, which also features Maltese and foreign poetry films, Maltese jazz bands, a book stall, a book binding stand by Kotba Calleja, drinks and a selection of food provided by Migrant Women Association Malta. The authors participating in this XIIth edition are Asja Bakić (Bosnia Herzegovina), Mourid Barghouti (Palestine), Lilia Ben Romdhane (Tunisia), Jean Portante (Luxembourg), Zoë Skoulding (Wales), Ma Thida (Myanmar), Arvis Viguls (Latvia), Gjoko Zdraveski (Republic of Macedonia), and John Aquilina, Mark Camilleri, Immanuel Mifsud, and Alfred Sant from Malta. Readings will be mostly in Maltese and English, but some short works will also be read in their original language. This year’s festival is part of a three-year Cultural Partnership Agreement between Inizjamed and Arts Council Malta. This is an important agreement because it offers concrete support in terms of training and financial resources to three editions of this independent festival and allows Inizjamed to plan ahead with peace of mind. The Festival is also part of the Literary Europe Live platform funded by the Creative Europe programme of the European Union and managed by Literature Across Frontiers. The writers reading on Thursday 24th August are the Maltese poet based in London, John Aquilina, whose debut book of poetry won the National Book Prize; Tunisian poet and performer Lilia Ben Romdhane who writes in the Tunisian dialect; poet Gjoko Zdraveski from the Republic of Macedonia; and Maltese novelist Alfred Sant, who will be interviewed by writer and translator Mark Vella. This first evening features the premiere of one of two Maltese poetry films commissioned by Valletta 2018 Foundation and Inizjamed and introduced by film director and lecturer Kenneth Scicluna. The film of Maria Grech Ganado’s poem “Relazzjoni” is by Nicky Aquilina and Lyanne Mifsud. Live music on Thursday will be provided by the internationally renowned jazz guitarist and artistic director of the Malta Jazz Festival, Sandro Zerafa, accompanied on the bass by Oliver Degabriele. On Friday 25th August, the writers invited to read are Maltese crime novelist Mark Camilleri; the French-language poet and novelist from Luxembourg Jean Portante; the Bosnian poet and short story writer Asja Bakić; and the celebrated Palestinian writer Mourid Barghouti, author of poetry and prose, including the memoir I Saw Ramallah, who will be interviewed by Norbert Bugeja. This second night features the premiere of the poetry film of Victor Fenech’s work “Fuq Għoljiet Dingli” by Trevor Borg, which will also be introduced by Kenneth Scicluna. Live music on Friday will be provided by the duo made up of John Bartolo on drums and Jimmy Bartolo, who plays on Brikkuni’s latest album, on guitar. During the readings on Friday (8.00pm – 11.00pm), children are being invited to attend an open workshop in Maltese and English on story writing and building papier-mâché models for festivals and other outdoor activities. This parallel event, which is part of the Oħloq Kultura programme, is being organized by More or Less Theatre in collaboration with the Valletta 2018 Foundation. Parents who would like to enrol their children for this workshop are to write to [email protected], indicating what time they will be attending. The writers reading on Saturday 27th August are Welsh poet Zoë Skoulding; renowned Maltese poet and novelist Immanuel Mifsud; Latvian poet Arvis Viguls; and Burmese prose writer and political activist Ma Thida, who will be interviewed by writer Clare Azzopardi. Her most recent book, the prison memoir Sanchaung, Insein, Harvard was published in English worldwide with the title, Prisoner of Conscience: My Steps through Insein in 2016 (Silkworm, Thailand). This third and final evening also features a foreign poetry film introduced by Noel Tanti and live music by John Bartolo on drums and Jimmy Bartolo on guitar. Some of the literature read during the festival might require an adult audience. The pre-Festival events featuring the invited authors and festival organizers from the Literary Europe Live platform are being held on Sunday 20th August, Tuesday 22th, and Wednesday 23th, all starting at 8.00pm. There are also two events at Fort St Elmo that start at 7.00pm on Friday 25th and Saturday 26th. 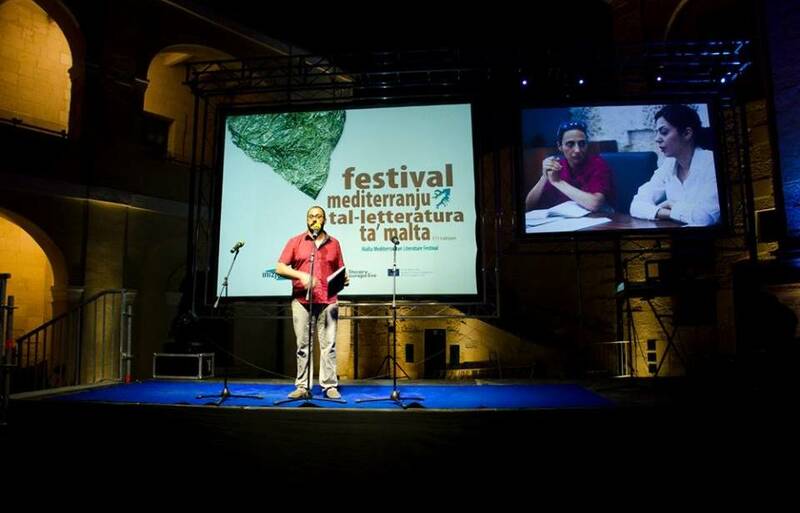 The 2017 edition of the Malta Mediterranean Literature Festival and the Malta LAF translation workshop are being held in partnership with Arts Council Malta and Literature Across Frontiers, and with the support of Valletta 2018 Foundation, Heritage Malta, and the Għaqda tal-Malti – Università. The MMLF is the recipient of the EFFE Europe for Festivals, Festivals for Europe label. The new Festival logo and promotional material were designed by artist Pierre Portelli. More information is available on Facebook on pages of Inizjamed Malta and the Malta Mediterranean Literature Festival 2017.